The La Sal Mountains of Utah as seen on the drive from Colorado. I was living in Ouray, Colorado for the winter ice climbing season. On one of my rest days from the park I decided to head out of the snow and ice laden San Juan Mountains and head into Utah. 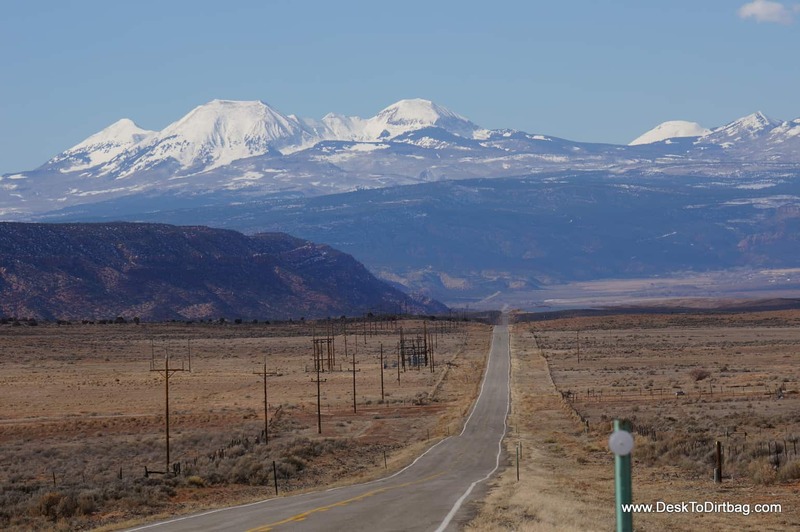 The drive is absolutely beautiful leading toward the La Sal Mountains. Not far from where this picture was taken I got a flat as my tire exploded in this desolate nowhere… No cell phone reception, not much civilization in sight. Thankfully I had a spare and the tools to change it. Except my lug nut wrench was small and it was SUPER hard to get any torque to remove the nuts… I struggled with it for a while and eventually an old man stopped and offered up his 4-way lug nut wrench (definitely have one of these) which made it way easier. I got it changed and continued on my way to Moab, Utah. I planned to go camp below Fisher Towers before getting my flat… I didn’t want to change plans despite the fact that I was a little worried about the off-road driving with my little spare tire and no backup, so I just drove slow and headed out there anyway. It was worth it to camp below this iconic desert climb. The next day I went and got my tire replaced in town at Chip’s (recommended place if you need service) and enjoyed a delicious breakfast burrito at the Love Muffin Cafe (definitely go here). While the quick overnight trip to explore a new area didn’t work out exactly as I’d hoped, it was worth it to see this stunning view of the La Sal Mountains, and to camp below the Fisher Towers. I also made my way back over to Arches National Park after getting my new tire and definitely loved it… But I’ll save that for another post. Hey! That’s my stomping grounds!! I love that drive from Ridgway/Ouray over to Moab!